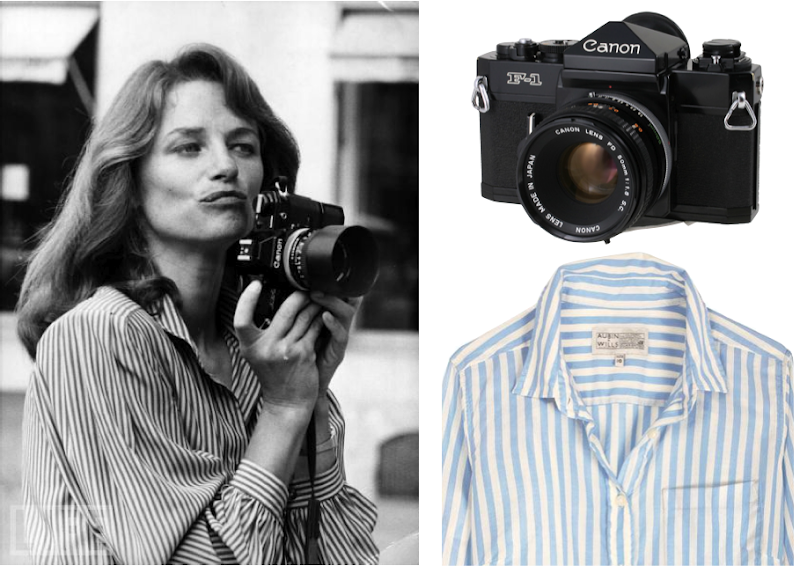 Photo of Charlotte Rampling trying out a new career as a fashion photographer at the ready-to-wear show of Parisian couturier Christian Charrat in 1975, via The LIFE archives. Rampling has successfully run the gamut of tomboy style, wearing everything from velvet tuxedos to three-piece pinstripe suits. But despite how she can pull off the most elaborate of ensembles, I think she looks so at ease and yet so perfectly chic in a simple button-down oxford. She's been on this blog before, but thank you Angelica for reminding me how great she is. Canon 35mm F-1 (produced from 1971-1976, available used); Carrbank shirt ($112). I have that picture of her from long ago where she's unclothed and turned sideways with her hand covering her chest on my pinterest board. Rampling is probably the woman I'd most like to look like--she's an icon of natural beauty and style to me, and the fact that she's not plastic or sculpted by doctors makes her just about perfect. She's almost the opposite of what the media wants the world to think of as beautiful today, isn't she? Awww, thanks for the shout-out, Lizzie! Ms. Rampling is just the epitome of smartness. Check out that discerning gaze. & her clothes? Oh yes, tomboy staples! Oh dear god. Charlotte Rampling.